Shot a 2700 at Erie County Conservation in northern OH. John Kovalan and family does a great job. I've been trying to hone down my plans for Production Class. Still working on a plan Using a revolver or an LDA pistol for the long line. Some issues. My 625 revolver/load/technique/ammo is not as accurate as I'd like at 50 yd and my technique on the short line could use some work. Shot just under 800 with the wheel gun 796 or something. In .45 I shot a Para Ordnance LDA 7.45. Accuracy on the long line is not there at all. Fixed sights so my aim is Sub-7:00 hold (yeah I didn't like it either) While this 1911 is not what John Browning had envisioned it does work and pretty accurate for a stock pistol. By the end I was keeping most shots in the 10 ring. Coupld of thoughts came to mind. - Switching pistols - Could I shoot the slow fire match with the revolver then switch to the LDA for the NMC, timed and rapid matches? Food for thought? I believe I can work up an accurate load with the revolver, find the best cylinder and best load to make the gun shoot great at 50. I'd have to shoot the NMC slow with the LDA but could take a few slow fire point penalties and still survive. - Changing barrels and sights on the LDA. Production class rules state I can cange barrels. What about just changing the bushing? There seems to be a lot of play between the bushing and slide as well as bushing and barrel. Find it hard to believe it is as accurate as it is with such a loose front end. - Changing sights on the LDA. Since the pistol was made with fixed Iron sights, My understanding of the rules state I could change them but not switch to adjustable sights. I need to install a taller front or file down the rear sight so I can shoot 6 or CM. Before i start knocking the sights out looking to confirm that is withing the spirit and letter of the rules. - Classification and ranking. I was ranked Master outdoor prior to the new rules for Production, Will I get a new card since I've now shot two matches in the Production Division? Is there an official place I could ask these kind of questions. Referee, committee or someone specific? I am not an official but I can point out a couple of things.I probably won't keep your questions in order but here goes. No,you can not use a different pistol for slow and substained fire.Yes,you are correct if the pistol came without adjustable sights you may not change them to adjustable.No,you may not add a barrel bushing that changes the physical appearance of the pistol. I have no idea how they are going issue new cards.That is the most confusing reg I have ever read.And finally if the 625 has a barrel longer then 6" then it is not legal either.I shot a 821-15 with my 25-2 in March just for fun in the 45 match.It has a 6.5" barrel so it is not legal for production. Is there a range near Waldport? I am going to have to challenge you to 25-2's at 50 yds. Clarify that pre 25-2, the 1955 Model does qualify. We would have to go to Florence.Which is closer to you and close for me.I have a model 1955 25-2 and the barrel measures 6.5". That is overall length so maybe they don't count the throat area.That would be nice. I accept the challenge. Sounds like fun. Dan, please explain why you are even doing this? I was following your bullseye progress and seriously thinking you were heading toward being a high level contender at camp perry for a national championship. IMO that's where you should get back to while in your prime, you can play with all this off the wall stuff when your old. David's right. If you have big dreams, chase them now. Thanks for the vote of confidence Dave and Dewey. I did punch a couple of my goals. High Master Indoor, then a match personal best 2631 something. One of my goals is to break 2600 with iron sights. The production class rules appeal to me. I like the idea of stock pistols duking it out. The plan was to work out the bugs during the next three years and be the first person who establishes a record in that class. I do shoot better with a dot. To me, every match is a competition aganist Motorcycle_Dan, not everyone else at the match. Another long term goal was to get my distinguished rifle badge. Iron sights and production pistols fits in with the service rifle goals. I'll get there. To be honest, I enjoy the competition more than I enjoy winning. That's a great plan. With your work ethic, I'm sure you'll make it. Iron sight work with pistols really helps my rifle shooting. Isn't the production class like the probationary class in the Meaning there is really no structure at least at this point and matches are at the discretion of match directors and so far rarely held. It's just a division. Before, we had MK, SS, EX, MA, and HM. Now, we have that for Open, Metallic, and Production. Mostly, everything will be aggregated, but the results can be reported to NRA by class and division. 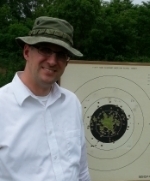 I've been shooting metallic with an iron sighted .22, an M9 and a 1911 Harball gun. We also have a guy shooting all revolvers in production. I should have my new classification shortly. Like Dan, I have some iron sight goals I want to achieve before going back to Open. Wonder how they will show the record for metallic since we all know that Hershel Anderson shot 2680 with irons? I got to do some soul searching on the "Why are you doing this" question. Part is because I consider this harder and more challenging. Part is because I compete to make me feel all warm and comfy. I think the turning point for me was shooting a 2609 at oak harbor, (for second place) And it did nothing for me. At one time a 2600 score would merit a round of beers, couple back flips and general woo Hoooo from my internal thrill-o-meter. This time nothing, That was when I decided to shoot production class in the outdoor season. So the reason is because I want to. I do think there will be several people shooting that division before records are established. I would like to be the first person to have their name in the record book. Our consensus is you can change guns with every "Match" (shoot 1 gun for the slow fire "match" a different gun for the NMC "match", yet a different gun for the timed fire "match", and yet another for the rapid fire "match". The problems with the logistics of administering the rule as they passed it has a lot to do with why you haven't seen any of this put into practice yet. I agree with David R.--stick with your program, or switch to Irons because YOU find it rewarding. I predict that this "classification" structure and "class record" portion of the rules isn't going to survive long enough for there to be separate records like you are describing. Because of the difficulty for a match director to make a judgment call about whether a gun is still "production" or has been modified, I predict a system where match directors giving awards to participants with "production like" guns or iron sights, but keeping the classifications the same. I think something missing in any discussion of "Production" class is a list of qualifying pistols. And maybe a list of non qualifying. Sig 226, stock, w/o enhancements like a comp. Beretta 92 with stock sights. Any 1911 with a single action trigger. a) Grips may be replaced or modified to fit the competitor’s hand or to facilitate loading. Checkering, stippling, grip tape and grip sleeves are permitted. b) Barrel length may not exceed 5.35 inches for semi-automatic pistols and may not exceed 6 inches for revolvers. c) Wide “target” style hammers and triggers, if included on the firearm as originally manufactured, are permitted. d) The front sight must be a non-adjustable sight. The rear sight may be adjustable, sights may be replaced but they must use the original dovetail cuts and must retain the original configuration of the firearm sight. Fiber optic sights are permitted. e) Barrels may be replaced with original factory or after market barrels with the same configuration and caliber of the original barrel. Modifications to the slide or frame to facilitate the use of the aftermarket barrel are not permitted. f) External finishes, either protective or decorative and other nonfunctional embellishments (such as engraving, inlays or inscriptions) are permitted. a) Milling of slide, slide ports are allowed on only factory-original approved models. c) Changes in the original factory sight configuration of the firearm are prohibited, front adjustable sights. d) Peep, ghost, optical, electronic, Bo-Mar and Aristocrat type sights. e) Thumb rest grips or magazine extensions. f) Compensators ported or weighted barrels. So a model 39 all generations is legal and so is a model 52 no dash. I would say no. Model 52s are single action semi autos. DA/SA guns might not make that cut on the same grounds. The rule wasn't well thought out. By the time enough thinking does go into this rule, we might find that they scrapped the whole idea and started over. I was hoping someone would swallow that hook. The model 52 unlike the 52-1 and 52-2 was a double action.They scrapped it pretty quickly and went to the 52-1. I think they only made 3500 of them.I threw that out there because I agree with you 100% that this was not thought out.There should be a list or box (no that's IDPA) or for sure rules we don't have to guess if were legal. I think we should start a pool and see who wins on when they scrap it. Hook wasn't too sharp I hope.